While commonly associated with seniors over the age of 60, Low Vision also affects children and adults of all ages. Certain birth defects or medical conditions - regardless of age - can cause Low Vision and negatively impact quality of life. Albinism causes the central part of the retina, called the macula, to develop improperly. Albinism makes the retina pale, reducing central vision. Patients with albinism usually have impaired vision, crossed eyes, lazy eyes, and a sensitivity to bright light. A condition that causes the naturally clear lens inside the eye to become cloudy, resulting in vision impairment. Cataracts often cause glare, reduced acuity, change of color vision, and reduced contrast. This condition occurs in diabetics as a result of high blood sugar levels. This causes leakage of blood or fluid from the blood vessels in the retina. As the disease progresses, new blood vessels develop that continue to damage the eye, resulting in vision loss. Our patients with Diabetic Retinopathy turn to us to help them with their vision loss. We can prescribe low vision glasses and other low vision aids to help with activities like cooking, reading, or driving, and improve their ability to recognize faces of the people they care about. This eye condition affects the innermost layer of the cornea, causing improper amounts of fluid to enter the cornea, or front “window” of the eye. Patients will have eye pain, sensitivity to light, difficulty with night vision, and cloudy vision. An eye disease that causes damage to the optic nerve, due to a buildup of pressure in the eye. Glaucoma causes a loss of peripheral vision - the ability to see to the side without moving your head or eyes. Peripheral vision is required for mobility. Reduced peripheral vision causes a lack of independence. However, low vision glasses and other low vision aids, including orientation/mobility training can get you moving safely again. Because peripheral vision is so important, when it is limited or lost, you may feel held back. Don’t let this condition hold you back - let us provide you with Low Vision aids like bioptic telescopic glasses and magnifiers. IALVS doctors can help you regain your independence and enjoy things like reading, driving, and other household tasks once again. This is a disease caused by infected airborne spores, and it is the leading cause of vision loss in Americans aged 20-40. Straight lines will appear crooked and blind spots in the vision field will develop. This affects both children and young adults. Young patients with this eye condition will have problems with central vision, focusing, blurry vision, and seeing clearly in dim lighting. It can have particularly negative effects in school, during extracurricular activities, and in sports. IALVS eye doctors can provide you with a prescription low vision glasses and Low Vision aids, such as bioptic telescopic glasses, full diameter telescope glasses, electronic devices and handheld magnifiers. These devices can help with everyday tasks like reading your favorite book or driving to meet friends. IALVS eye doctors can provide you with a number of Low Vision aids, such as bioptic telescopic glasses and handheld magnifiers. These devices can help with everyday tasks like reading your favorite book or driving to meet friends. This eye condition occurs when there is a small break in the macula. Located in the light-sensitive tissue of the retina, issues with the macula can cause blurriness and distorted vision. This makes it difficult for patients to read, watch TV, drive, and see in sharp detail. Nystagmus is an eye condition that causes involuntary and repetitive eye movements or shaking of the eyes. Patients with Nystagmus have trouble focusing and maintaining balance. This is a condition where the optic nerve is damaged due to glaucoma, stroke, genetics, autoimmune conditions, or brain injury. Since this nerve carries impulses to the brain, when it is damaged, there can be difficulties with central vision and/or peripheral vision loss. This is an eye condition where the patient has severe nearsightedness, also known as myopia. The eyeball continues to become more and more elongated, causing a stretching of the retina. Often, the macula is damaged, causing central vision loss. Retinitis Pigmentosa (RP) is a genetic eye condition that causes the retina to gradually deteriorate. It affects peripheral vision and can result in night blindness or even total vision loss. Our experienced and caring doctors can prescribe low vision glasses or suggest several types of Low Vision devices to help improve vision functionality. If you have Retinitis Pigmentosa, aids like reverse telescope glasses may be able to increase the size of your visual field, allowing for improved mobility. If your central vision is affected, magnifiers may be the right solution. This is an inherited eye condition that causes the loss of the photoreceptors known as cones and rods. Photoreceptors are important because they respond to light. Rod-Cone Dystrophy initially causes central and color vision loss occurs, followed by night blindness. When the brain is damaged due to a stroke, brain injury, or tumor, vision is often affected. Stroke often causes Hemianopsia, which negatively affects a person’s field of vision. Someone with Stroke-Hemianopsia may be unable to see to the left or right from their main focal point. Because the effects of a stroke can be particularly serious, choosing the right doctor for Low Vision care is so essential. Our doctors help patients from all over the US and Canada with Stroke-Hemianopsia adapt to vision loss and learn how to refocus. 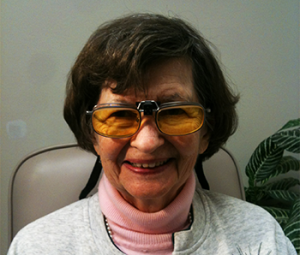 We can prescribe Side Vision Awareness Glasses (SVAG) and other special prism glasses, that will improve your mobility as well as other low vision aids that can get back to reading, watching TV, and recognizing faces of the people you love. If you or a loved one suffers from any of these eye diseases, there is help available. IALVS doctors have extensive training and experience in helping patients with eye diseases easily manage their vision difficulties and live a fulfilled, satisfying life.